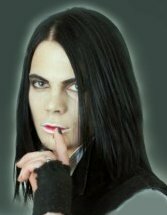 Gothic long-hairstyles-for-men are probably the most common to find. There are different styles of cuts and different ways to part the long hair on top. Long hair on men looks best when straightened. If you are lucky enough to have naturally straight smooth hair then you don't really need to read any further. However, if you are like the majority of the rest of us with natural wave to our long hair, you will need a straightener. Electric hair straighteners are like a curling iron, only flat and they not created equally. You want to find a high quality iron. Usually, you get what you pay for, so plan on spending some change for it. Hair product such as pomades and straitening gels can help you achieve the ultimate straight. Again, use high quality stuff in your hair. Go to a salon and get advice on the best product that wont cause buildup. Straight hair doesn't have to be pin straight. Applying a light mousse to your hair, blowing dry and quickly running a straightener through will give you the look to the right. Slightly loose, yet straight. Taking a small bit of pomade and rubbing briskly between your palms then lightly dragging over top of head to tame fly-a-ways will hold the style. This guy to the left doesn't necessarily have super straight hair, but it looks good, especially with the beard/goatee. Look closely and you'll see brownish ends. Although black is the tried and true color for Gothic hair, it doesn't always have to be.